Fireclip: Fireclip is a cool tool to clip out portions of webpages and reload them later and check for updates. It creates a gallery of clips that you can load quickly to check for updates. Very useful for sites that don’t offer RSS. Snowl: Snowl is an experimental add-on that gives you a sneak peek at the future from Mozilla Labs. You can readmy Snowl review here. Right now, it gives you the familiar browser interface to your Twitter feed – search, filter, etc. WebMynd: This is a treat for those who love social media and use Google a lot. WebMynd enhances your Google search results and persoanlizes it by letting you visualize your search history. It adds links to your favorite sources like Twitter, Wikipedia, Flickr as well as results from your search history. You have to try it to grasp its potential. It’s definitely worth a try, IMHO and have to warn you that it can be addictive. Search Cloudlet: Another add-on to enhance your Google and Yahoo searches by adding a smart tag cloud to the search interface. Its lets you refine your search reults by clicking on relevant tags and automatically re-searching based on yoru selection. You can even exclude results from spammy sites by adding them to ‘Sites’ button in this add-on. Automatic Save Folder: A blessing in disguise for anyone who downloads a lot of files from the Internet. You can set filters based on domains and filenames and set it to automatically download files to certain folders of your choice. Saves a ton of time for me. 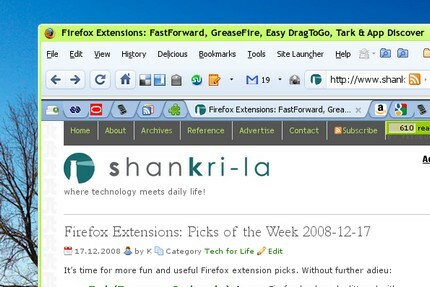 Firefox 3.1 b3 is set to be released on Feb 2nd, 2009 and I am looking forward to it. If you have taken a liking for the Google Chrome interface but still can’t make the switch because of all the great extensions available for Firefox, Chromifox theme could be the answer for you. Chromifox even plays nice with the FaviconizeTab Firefox extension. If I re-instal my firefox, will automatic save folder lost my data? Power Twitter is awesome. One of the best FF adons I’ve downloaded. I’m also a big fan of twitter and definetely going to give that one a try. Thanks for the heads up. I like the sound of the automatic save folder, sounds like it could save a lot of time. One of my favorite from firefox is Morning Coffee. It is pre-programmed by you to open all the different sites that you want to look at or frequent in separate tabs with the click of one button. Pretty cool. I’m starting my twitter experience soon. Let’s hope power twitter will help me in my efforts.